Garstang extended their winning run to four matches with a 5-4 victory against Chadderton in midweek. The early exchanges belonged to the visitors with a couple of corners causing some early scares and the first chance seeing the ball go narrowly over the Garstang bar. Garstang responded as Dan Birch burst forward into midfield and played the ball to Jonny Hothersall, whose shot went just wide. The Riversiders took the lead when Ben Roberts dispossessed the left-back 30 yards from goal, took the ball into the box and shot into the far corner. Chadderton should have equalised when another corner was turned wide from just three yards as Garstang led 1-0 at half-time. The first half gave no clues as to what was to follow as the second half rained goals. Billy McKenna came on early in the half for Jack Swindlehurst and was soon in action with a 40-yard chip going just over and another effort deflected narowly wide. 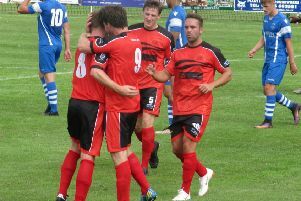 Ric Coar headed over from Roberts’ cross before the visitors equalised on 57 minutes. A free-kick was only half-cleared and the ball played back into the feet of Harry Pratt, who finished from 12 yards. Roberts and McKenna linked up well to set up Coar, who shot over the bar as the match became very stretched with both sides looking to score and more space opening up for the Garstang attackers. Garstang soon capitalised on this extra space when McKenna laid a good ball into the path of Roberts, who once again finished with aplomb. Lee Baker made a further change with Tom Graham replaced by Josh Westwood, who went into the centre-back position as Cameron Ross moved into midfield and gave added protection to the defensive line. It worked as Ross cleared his lines and the very lively McKenna picked up the ball up and fired home from 18 yards to make it 3-1 on 67 minutes. The game was far from over as, three minutes later, Corey Kelly stunned everyone with a 25-yard strike out of the blue to reduce the deficit. However, McKenna fired home his second from inside the box to re-establish a two-goal cushion on 73 minutes before Coar was on hand to make it 5-2 10 minutes later. Garstang now looked in control as the clock ticked down but switched off in injury time. Some sloppy play saw the visitors score two quick goals in added time through Bailey Whalley as the lead was reduced to just one goal in the end, much to the manager’s unhappiness. It was a question of too little too late for the visitors as the referee blew his whistle for another three points to a resurgent Garstang side as the scoreline somewhat flattered the visitors.